popular Vegas Vibes slot game. He and his girlfriend plan to take a dream vacation in the Alps. was the $277,482 jackpot Joe P won playing the Pyramid Plunder slot. “Wow! 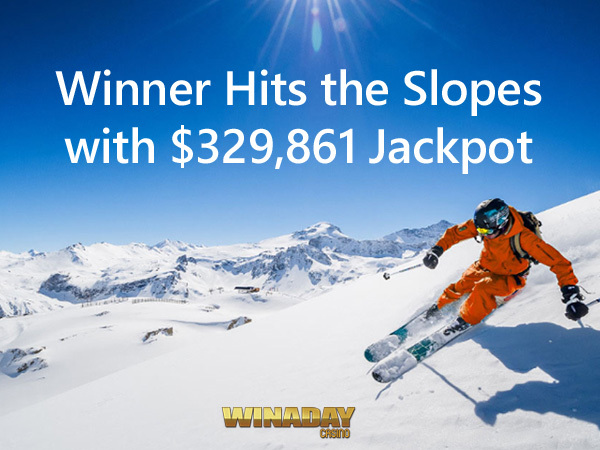 Every jackpot win seems to break a record lately!” said WinADay’s casino manager, Michael Hilary. up my bet to max. That’s when I hit the jackpot!” he said. “Winaday’s slots are easy to play on my phone. When asked if he had advice for other players, James said “One day will be your lucky day. To celebrate James’ windfall, WinADay made Vegas Vibes its Game of the Month for February. tickets in a Cash Draw at the end of the month. May be claimed 2x per day; wagering requirement 27X. Every 500 rounds on Vegas Vibes earns one ticket. Winners randomly drawn and announced March 18.
deposits and withdrawals now include cryptocurrency (Bitcoin, Bitcoin Cash or Litecoin).